Yesterday, hopeful fans of the infamous Tomb Raider series got their first look at Alicia Vikander as the renowned Lara Croft in action with the first ever teaser trailer. With the movie picking up Croft's origins story from the 2013 video game reboot, seeing Vikander as a young Croft was exciting for fans of this gaming staple. We've gotten quite a few sneak peaks into the latest Lara Croft to see the big screen, showing off an incredibly accurate portrayal of the 2013 game's protagonist. 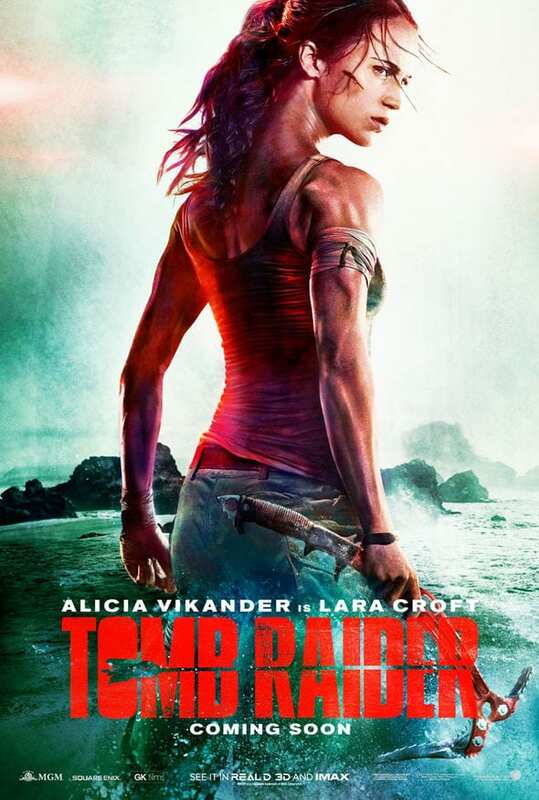 The most recent poster to have been revealed showed a different side to the "hero", showing a fierce inner strength that the young Croft finds within the series' reboot. "Lara Croft is the fiercely independent daughter of an eccentric adventurer who vanished when she was scarcely a teen. Now a young woman of 21 without any real focus or purpose, Lara navigates the chaotic streets of trendy East London as a bike courier, barely making the rent, and takes college courses, rarely making it to class. Determined to forge her own path, she refuses to take the reins of her father’s global empire just as staunchly as she rejects the idea that he’s truly gone. Advised to face the facts and move forward after seven years without him, even Lara can’t understand what drives her to finally solve the puzzle of his mysterious death. Going explicitly against his final wishes, she leaves everything she knows behind in search of her dad’s last-known destination: a fabled tomb on a mythical island that might be somewhere off the coast of Japan. But her mission will not be an easy one; just reaching the island will be extremely treacherous. Suddenly, the stakes couldn’t be higher for Lara, who—against the odds and armed with only her sharp mind, blind faith and inherently stubborn spirit—must learn to push herself beyond her limits as she journeys into the unknown. If she survives this perilous adventure, it could be the making of her, earning her the name Tomb Raider." Slide 2/2 – Are you pumped?! With Norwegian director Roar Uthaug at the film's helm, and a steady inspiration from movies like Raiders of the Lost Ark, it is definitely looking like fans may finally get the Tomb Raider film they've been hoping for. The last movie in the franchise starred Angelina Jolie in the more mature Croft attire, but was met with less than positive enthusiasm. Perhaps the origins story is the true tale needed to let the iconic archaeologist and adventurer shine through. Her legend begins on March 16th, 2018 in theaters everywhere. Are you ready?